The 1.2V AA 3000 mAh BTY NiMH batteries are something that you may find in a lot of Chinese online stores as well as on eBay and what you will notice for sure with these batteries is that they are being sold very cheap for 3000 mAh capacity. These rechargeable AA batteries supposedly offer the very high capacity of 3000 mAh and the considering their very cheap price should raise an alarm, meaning that the capacity rating is most likely lower than advertised. 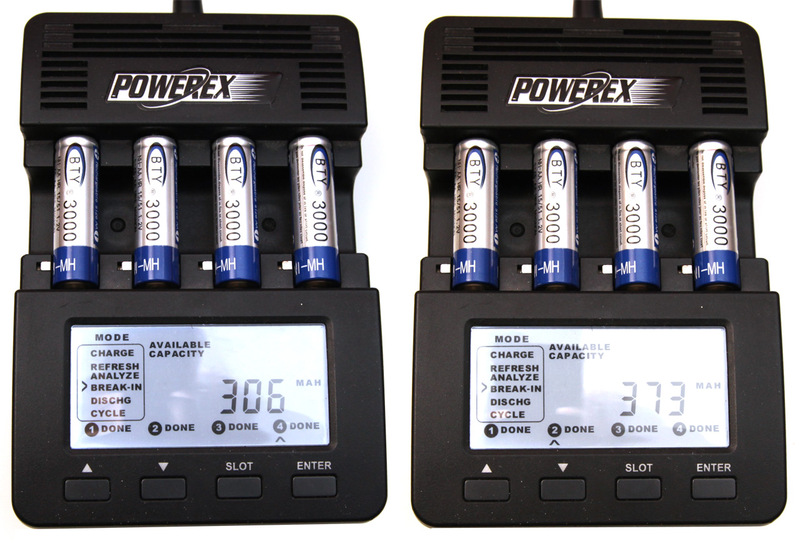 It is always a wise idea to avoid getting such batteries, but we got a pack of four in order to be able to test them and see what is the actual capacity that these batteries are providing and how much it differs from the advertised 3000 mAh. We were prepared for nothing more than half the advertised capacity, but going through a Break-In mode on the MAHA C9000 Charger/Analyzer we were not prepared for such a disappointment. 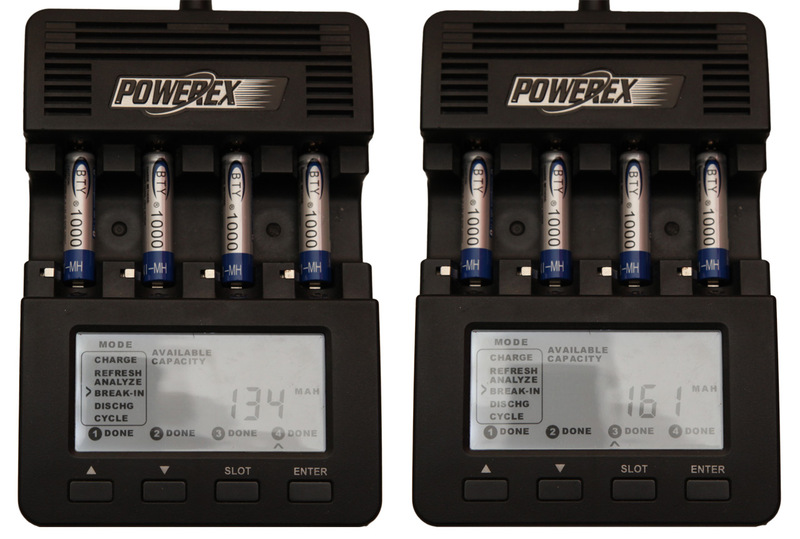 On the photo above you can see the minimum and maximum measured capacity of the pack of four batteries and you will get why we were so disappointed. In fact what we got as available capacity was as follows: 306 mAh, 334 mAh, 337 mAh and 373 mAh and that is from batteries that are being advertised as being able to provide 3000 mAh capacity, not worth buying these regardless of the price, hell they are not worth even if somebody gives them to you for free. Avoid buying 1.2V AA 3000 mAh BTY NiMH batteries, they are really not worth it!!! The 1.2V AAA 1000 mAh BTY NiMH batteries are something that you may find in a lot of Chinese online stores as well as on eBay and what you will notice for sure with these batteries is that they are being sold very cheap for 1000 mAh capacity. The fact that these rechargeable AAA batteries supposedly offer very high capacity of 1000 mAh (among the highest for AAA size NiMHs) and their very cheap price should raise an alarm that the capacity rating is most likely lower than advertised. Normally in such cases it is a wise idea to avoid getting such batteries, but we got a pack of four in order to be able to test them and see what is the actual capacity that these batteries are providing and how much it differs from the advertised 1000 mAh. We were prepared for nothing more than half the advertised capacity, but going through a Break-In mode on the MAHA C9000 Charger/Analyzer we were not prepared for such a disappointment. 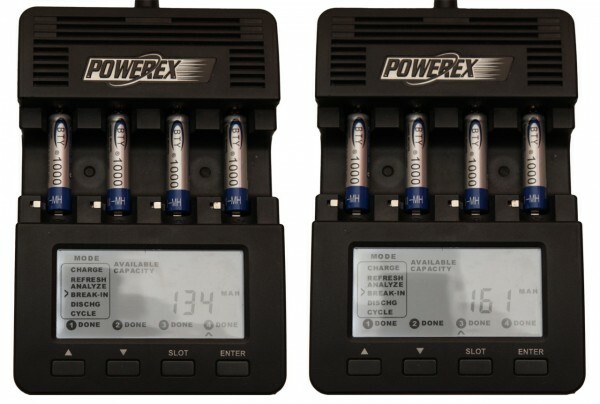 On the photo above you can see the minimum and maximum measured capacity of the pack of four batteries and you will get why we were so disappointed. In fact what we got as available capacity was as follows: 134 mAh, 140 mAh, 144 mAh and 161 mAh and that is from batteries that are being advertised as being able to provide 1000 mAh capacity, not worth buying these regardless of the price, hell they are not worth even if somebody gives them to you for free. Avoid buying 1.2V AAA 1000 mAh BTY NiMH batteries, they are really not worth it!! !